Building Block Press, 9781944201142, 32pp. 2019 PAL Award Winner You're Invited It's time for Mouse's Surprise Party, but Owl's glasses are broken. It's a good thing you came along Can you use the clues to help Owl figure out which guest is at the door? Hoo hoo who could it be? 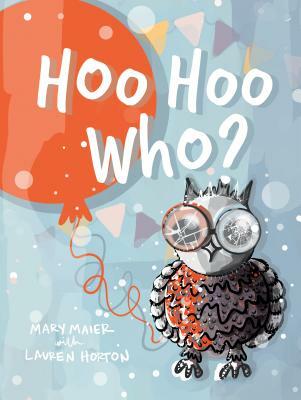 In this catchy and interactive book, children are encouraged to take part in the story and use expressive language to respond to Owl's WHO questions. With engaging opportunities on every page, children will be excited to read this story again and again. Who doesn't love to yell "Surprise " and sing "Happy Birthday"? The bold and distinctive illustrations are refreshing for parents, and particularly enthralling for children who will be naturally drawn to the curvy and circular shapes. Mary Maier graduated from Miami University (where she met her husband) with a degree in Art Education. She is an avid painter with a huge imagination; an important quality when raising two wild boys. She resides in Louisville, KY. Lauren Horton received her Master's Degree in Speech-Language Pathology from Ball State University in December 2016. Lauren was born in Muncie, Indiana, but now resides in Atlanta, Georgia with her husband.